Princess Magnolia struggles to conceal her secret superhero identity in this action-packed sequel to New York Times bestseller The Princess in Black. 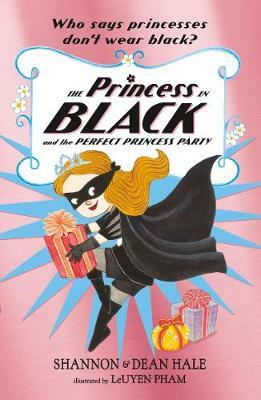 A superhero princess, inconvenient monster alarms, a glittering party and spot-on slapstick pacing all abound in this sequel to the New York Times bestseller The Princess in Black. Today is Princess Magnolia's birthday party, and everything is going wrong. Just as her guests are arriving ... Brring! Brring! It's the monster alarm! Princess Magnolia has to run to the broom cupboard, ditch her frilly clothes, and become the Princess in Black! She rushes to the goat pasture, defeats the monster, and returns to the castle before her guests discover her secret. But every time Princess Magnolia is about to open her presents, the monster alarm rings again. And every time she rushes back - an inside-out dress here, a missing shoe there - it gets harder to keep the other princesses from being suspicious. Don't those monsters understand that now is not a good time for an attack? Shannon and Dean Hale are the writing team behind the critically acclaimed Princess in Black series. Shannon is also the New York Times bestselling author of the Ever After High trilogy, as well as the Newbery Honor-winning Princess Academy. They live in Utah with their four children and a small plastic pig for a pet. @haleshannon @Halespawn LeUyen Pham is the illustrator of many books for children, including God's Dream by Archbishop Desmond Tutu and Douglas Carlton Abrams and Aunt Mary's Rose by Douglas Wood, as well as the Freckleface Strawberry books by Julianne Moore. LeUyen Pham lives in California.